This handsome steel tourer is a new entry into the increasingly popular drop-bars and discs category from German company Tout Terrain. Designed by Swiss ex-downhill biker Florian Weismann it boasts exotic kit, unusual design touches and an eye watering price tag. 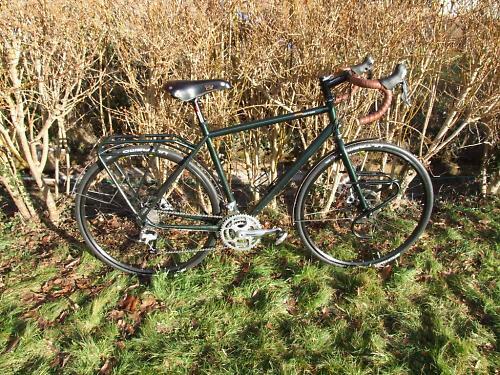 Don't be fooled though, this is a heavy duty touring bike, not the fast randonneur that the Tout Terrain website suggests. I'm a big fan of disc brakes on road bikes - they are more powerful than rim brakes, more reliable in the wet and don't chew lumps out of your wheels. The weight penalty might preclude them from appearing on featherweight racers but on bikes with more humble aspirations they make perfect sense. A few years ago they were almost unknown, now we have the Kona Dew Drop, the Kona Sutra, the Salsa Fargo and Vaya and the Jamis Aurora that was being thrashed round Bath on test as I was hitting the roads of Devon. 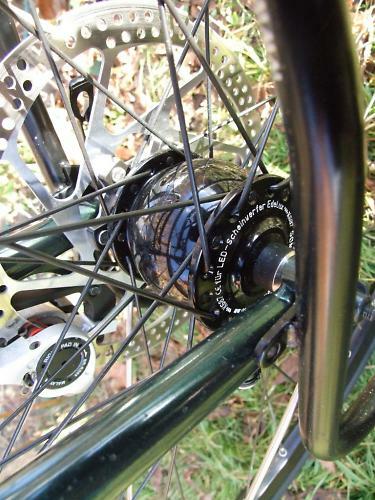 Choice of brake is usually limited to either Shimano BL-R505s or Avid BB7s. The Grande Route comes with the Shimano offering and although they do work they lack the bite and crisp lever feel of the BB7s. With a German company and Swiss designer (his name is emblazoned on the chainstay, just in case you forget) you'd expect immaculate engineering and Design with a capital D. You'd be right too, the Grande Route is designed to within an inch. In some ways I felt like I was riding a bike that had been fully customised to someone else's spec. The bosses under the top tube had me scratching my head, as did the little rubber plugs in the rack. Then it dawned, they were there to carry the wiring to a rear light, via the inside of the rack tubing. Not a problem that I'd ever needed a solution to, but sort of neat. The integrated rack also had me confused. Yes, it's strong, stiff and tidy, but it adds weight that can never be removed, the painted finish is vulnerable to scuffing from panniers, unless you cover it in ugly tape and it's made from fat tubing that won't accept older panniers, such as my seven year old Ortliebs. Again, it's a somewhat over-engineered solution to a problem that I've never had. The frame, made from Dedaccai tubing, is beautifully finished and also features a fitting for a kick stand, should you want one. It only comes in one colour, a classy dark green which works particularly well with the brown bar tape and saddle, unless you want to shell out an extra £83 for a custom paint job. Leaving the chainset/chain aside for a moment the rest of the kit works just fine. Ultegra shifters are crisp and precise, bar tape and handlebars feel comfortable, the Brooks Swift is an old friend and the Schwalbe Ultremos roll fast. They're an aberration though, regular bikes will come with Duranos which should be tougher and a better match to a touring bike than the fast but fragile Ultremos. Where I did get grumpy is with the mudguards. 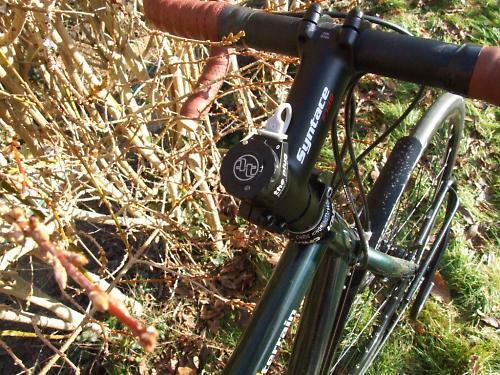 By coincidence Big Dave reviewed a set last month and while they look smart and are a quality item, their flat profile means they need to be set close to the tyre to work effectively. Not so on the Grande Route - here they are set way too high and as the rear 'guard is bolted to the frame in four (count 'em) places you don't get to fiddle with it. Sure, you don't get a spray stripe up your back but the rest of the bike gets covered. On a bike that feels like it's been designed to within an inch of it's life that seemed like a weird misfire. I checked with Oliver from Tout Terrain and he explained that the bike we were sent had been set up for larger tyres and that retail bikes would have the mudguards fitted with little rubber bumpers to bring them closer to the tyre. The most interesting extra is the Plug USB charger. It has the potential to be an invaluable touring asset but I didn't make much use of it as the Garmin Edge 800 I'd borrowed refused to work and charge up at the same time. We're hoping to get one in soon for a more thorough test. Tout Terrain bill the Grande Route as a 'classic randonneur' for 'great distances in a sporty pace' which makes it sound like the perfect choice for audaxes. The full touring rig (integrated rear rack and low-riders, provision for three bottle cages) that it came with suggested that it's true metier lay elsewhere. It's heavy as well, 14kg, including extras like a hub dymano, USB charger and those low-rider racks. I wasn't expecting a nimble racer but nor was I expecting it to be quite so slow and stodgy, this really isn't a bike that likes to be hustled. Load it up with panniers, lose the expectation of speed and embrace a slower pace and it makes much more sense. Weirdly it even seems to climb better with a full load as it's easier to drop into twiddle mode and push against the weight as you chug your way up. At first I took Tout Terrain at their word and rode the bike as if it were an audax machine. Commuting, evening rides with friends, even an actual audax. Although the upright riding position was always comfy, helped by the Ultegra hoods, the bike felt sluggish and unwilling, especially up hills. The 48/36/24 Middleburn chainset, mated to an 11-28 rear block, should have given a more than adequate range with a 22.9" bottom gear but despite this fighting gravity was more of a chore than usual. As an added complication the narrow 10spd chain and the tiny 24t inner ring didn't get on well. Trying to shift between the inner ring and the middle ring under any kind of load would instantly result in the chain jumping off and wedging itself between the chainrings. And when I say wedging, I do mean wedging. Luckily I had a metal tyre lever (old school Carradice, remember the review?) to act as a de-wedger. Once I'd worked out the trick of slacking off before shifting (and uttering a small prayer to St Andy of Luxembourg) it was fine, but turning a corner to face a sudden sharp rise usually meant a sudden stop followed by a brief oily fettle. And a lot of swearing. It would be annoying enough on a £500 bike, but on a bike costing this much it's unforgivable. An exchange of e-mails with my new friend Oliver revealed that the problem is down to the front mech being pushed to it's limits by the tiny 24t chainring. Although the current set-up allows closer gear ratios on the larger rings (Tout Terrain's rationale behind retaining the arrangement) I feel that on a touring bike, and that's what this is, the twiddly ring is more important than ever, so compromising it makes no sense. A 26t small ring combined with a 30t rear sprocket should solve the problem while maintaining the smallest bottom gear ratio and Tout Terrain have said that they are going to look into the possibility of changing the set up - I'll post back on here if I hear any more news. STOP PRESS! Another e-mail from the tenacious Oliver explains that not only is the front mech being stretched to capacity, the spider that was fitted to our test bike was from a faulty batch with posts 1mm too long, hence the chain sized gap between rings. It's safe to say that production bikes won't suffer from this and should shift just fine. To be honest I spent a good portion of my 600 odd miles with the Grande Route feeling grumpy, bewildered and wondering what on earth this extravagant, over-engineered gin palace of a bike was actually for? Speaking to the company went a long way to fixing that - the mudguards will be different on retail models, it should be possible to resolve the shifting issue and they also made it clear that the bike is indeed a touring bike, not the fast randonneur that the website suggests. At the end of the day, if you want to blow your redundancy money/lottery winnings/pension on a high-end tourer with all the whistles and bells you could do worse than take the Grande Route. Tout Terrain say: "The Grande Route is a classic Randonneur who enables long distance riders to cover great distances in a sporty pace without abstaining from a comfortable seating position." I say: Comfy yes, fast, no. Works better as a full touring bike. Custom Dedacciai and Columbus tubing. Reasonably relaxed - what you'd expect for a bike like this. High front end, very similar to Kona Dew Drop. Comfortable reach and drops easily accessible. Very comfy riding position but not a plush ride. Quite a stiff ride actually, but the 28C tyres take the sting out. It always felt a bit sluggish. How would you describe the steering? Was it lively, neutral or unresponsive? Neutral, almost to the point of being lazy. Upright position means centre of gravity is a little higher - this isn't a bike for flicking round tight corners. Ultegra hoods are very nice. Constant problems with the drivetrain but this is most likely down to the particular chainset fitted to the test bike - production models should work fine. Like a boulder falling uphill. More carthorse than mountain goat. The chainset/chain/front mech combination wasn't a happy match but should work fine on production models. Regular bike comes with Schwalbe Durano tyres, not Ultremo. Schwalbe Ultremos were lovely - very fast rolling and smooth. Not the standard tyre though and probably too fragile for a bike like this. Schwalbe Duranos are the regular tyre and a better match for a bike like this. Mixture of the great, the good and the weird. Mostly high to super high end stuff. Middleburn crankset had me tearing my hair out - gap between small and middle rings just wide enough to thoroughly wedge a 10-speed chain but this was down to a faulty spider on our test bike. Did you enjoy riding the bike? As a heavy duty tourer, yes. Unloaded it's frustrating and slow. Frustratingly slow and ponderous, until you load it up. Then it all makes sense. Sounds a bit heavy as well, my overburys connosseur bought in 1986 is way lighter and still rides like a dream. Its even lighter since losing the front mudguard to a tree branch on the towpath where i took a wrong turn! Made riding up Avoncliff hill a bit easier though!! But there are other machines on the market that are 1/3rd of the price with frames that would make as good a starting point. I also have a niggling suspicion that disc brakes might overheat on a fully loaded bike down a mountain pass which would be very scary. Anyone had this problem?